For Valentines day (belated), I baked my boyfriend World Peace Cookies. This recipe is from Dorie Greenspan’s Baking: From My Home to Yours and I thought it was really good! I didn’t have any fleur de sel but I used a fine sea salt instead (which was something she said you could substitute). Normally, I don’t like full out chocolate cookies but these were really good. The sea salt was a nice little addition too and it went really well with the chocolate. Sift baking soda, cocoa, and flour together. Beat butter on medium speed until the butter is creamy and soft (preferably with a stand mixer). Add the granulated and brown sugar, vanilla extract, and salt. Beat for an additional two more minutes. Turn the mixer off and add your dry ingredients. If using a stand mixer, drape a kitchen towel over the mixer to stop flour from flying around the kitchen. Pulse at a low speed around five times, making sure to do it for at least a second or two each time. Peek to see if there is still a lot of flour on the dough’s surface, and continue to mix until the flour is incorporated into the dough. Try to work the dough as little as possible. Add the chocolate pieces, and mix to incorporate. Put the dough onto a clean work surface, and divide it into half. Shape each half into a log that is 1 1/2 inches in diametter. Wrap the logs within plastic wrap, then refrigerate for at least 3 hours. It can be kept in the fridge for 3 days, or frozen for two months. If frozen, it doesn’t need to be defrosted, just slice! Preheat the oven to 325F, and centre a rack in the oven. Line baking sheets with either silicone mats or parchment paper. Slice the log into rounds, making sure they are around 1/2″ thick. They may crack, but don’t worry. You can squeeze the pieces back together. Arrange the cookies onto the baking sheet, making sure to leave an inch between the cookies. Bake the cookies a sheet at a time, approximately for 12 minutes. They won’t be firm, or look done but they’re meant to be like that. Transfer to a cooling rack, then allow them to rest until they’re warm. Then serve or serve at room temperature! My only problems with this recipe was just trying to cut the logs when they were refrigerated. I couldn’t get a solid cut so I just ended up getting SOME nice looking ones, and some awful looking ones (which were really hilarious looking). My boyfriend says these cookies are “tasty” which isn’t really helpful when trying to sell you on some recipe, but trust me, these are! I kept eating them, even though they were his V-Day gift… Haha. Can’t win them all. I hope if you make a belated present, you’ll consider making these! People will be ooing and ahhing too much over the flavour to care that they’re late! 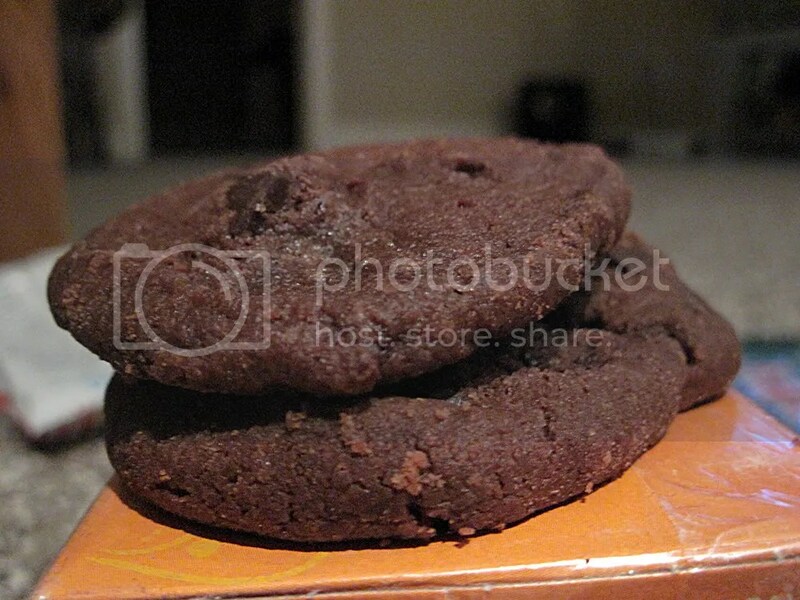 Yes, Dorie has some great chocolate cookie recipes, even though they’re usually not my favorite. Yours look scrumptious! I would love to eat one … or two ;)! Thanks a lot. 🙂 I haven’t posted anything in here for a while, so that’s kind of sad! Just been busy with school.